Only for two, but 12-player co-op should be on the way. 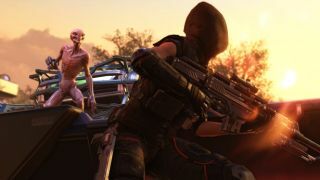 XCOM 2 in co-op sounds like a fun/potentially stressful time, so here's a new mod that allows you to take on the alien menace with a friend. Or a casual acquaintance. Or, well, anyone over the net. Tactical Co-Op adds (tactical) co-op to the turn-based strategy game, and while it's only playable by two people currently, the modders say they're "waiting on Firaxis to approve code" for 12-player battling. The mod doesn't work with missions with a turn timer, and it's not compatible with Ironman mode; it's also a bit buggy at the moment—according to the comments—so you might want to check them out before you begin. You'll find a guide telling you how to set up a game here. Also, have a look at our Best XCOM 2 Mods article for more ways to alter Firaxis' game.